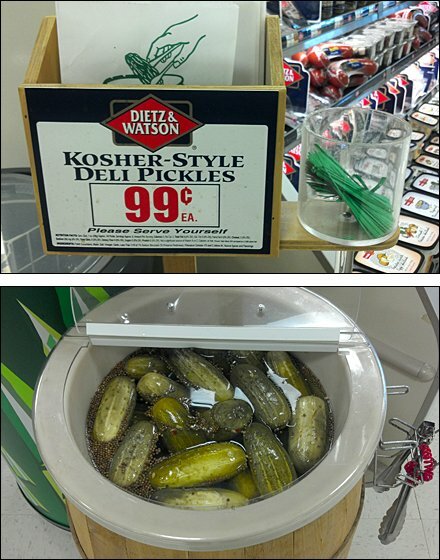 Nothing beats a deli-style Dill Pickle … at least not to a 100% ethnic Pole like myself. 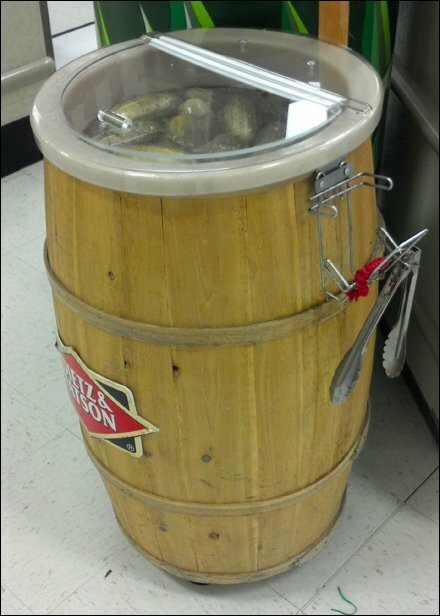 And nothing looks better and more natural than a Pimped-out Wooden Pickle Barrel for merchandising. Of course now even wooden pickle barrels come pimped-out with lots of bells and whistles … side-slung pickle tongs, food-grade plastic liner, see-through hinged top, billboarded Dietz & Watson bag bin and sidesaddle twist ties. CLICK the thumbnail for all the details. Frankly, I’d buy a pickle from this Pimped-out Wooden Pickle Barrel display. Would you? PreviousPrevious post:More Gucci Ties a Scarf Knot ReduxNextNext post:Vuitton Opens In-store Juice Bar?